PilotEdge checks for a specific dataref within X-Plane to determine whether to transmit on COM1 or COM2. 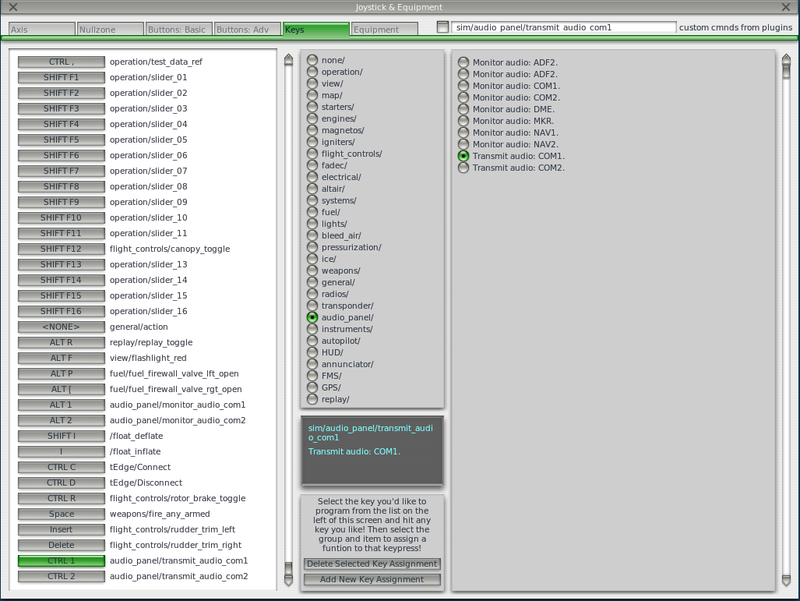 The dataref is sim/cockpit/switches/audio_panel_out. And you'll see this on your screen as a result. A value of "6" on the right side (the COM column) means COM1 is active for transmitting. A value of "7" means COM2 is active for transmitting. Note, setting these also has the side effect of setting your audio RECEIVE to match the TX radio. If you have COM1 AND COM2 selected for RX before, only one of them will still be lit up after changing the TX setting. This WILL become important when we release support for the simultaneous monitoring of COM1 and COM2 (this code is ready for release). This is more of a curiosity than a request. So airliners for the most part are required to monitor 121.5. On PE 121.5 seems to be a monitor of approach. With this change, it seems that you could change 121.5 so that it is more like RW Gauard. Used for emergencies or when the pilot stops listening to the actual control freq the controller can switch to guard to wake them up. Guard works on PilotEdge. However, our controllers don't have a separate PTT for Guard, so you're hearing the controller work other traffic. Long term, we may have a separate PTT for Guard, or we may open it as another position (worked by one of the already on-duty controllers) in which case it'll work more as you'd expect. Sounds good. More of a curiosity as the same reasons for it do not necessarily exist online. I will like being able to stay with Approch while listening to the CTAF. That is something I do in the RW as I get close to have an idea what is going on. It actually defaults to a Center position. As it happens, sometimes Center is wearing the TRACON hat as well. So if a Tower and below is working, that's what you'll hear most often. Source: I listen to Guard all the time when not on CTAF or w/ ATC. It actually defaults to a Center position. As it happens, sometimes Center is wearing the App/Dep hat as well. So if a Tower and below is working, that's what you'll hear most often. There's a good chance the controller got burned. I know it's happened to be before. If you tune your com2 after your com1 it sends the controller a notification that you changed frequencies and unless the controller manually checks, they can assume that you're on the right frequency. If the map said you were on 124.00, that's where you were. The live map isn't actually setup to handle dual comms properly. It just shows the COM1 frequency and nothing else. This is a good reminder for me to get that fixed since all the data is now available in the XML feed which drives the map, including the radio which was last used for transmitting. The controllers have access to a display which shows which of the two radios was last used for transmitting. I'll post a reminder to make sure that's being consulted, rather than using the last 'frequency alert' that came up. Keith Smith wrote: PilotEdge checks for a specific dataref within X-Plane to determine whether to transmit on COM1 or COM2. The dataref is sim/cockpit/switches/audio_panel_out. 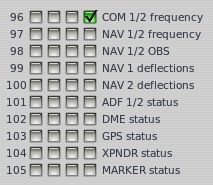 Is all of this still true for xplane 11 please -i.e pressing the buttons on audio panel that comes with the out of the box C172 has no effect on which com radio you are transmitting on ?